Showing a visitor around the Atomic Object office recently shifted my perspective in a useful way. 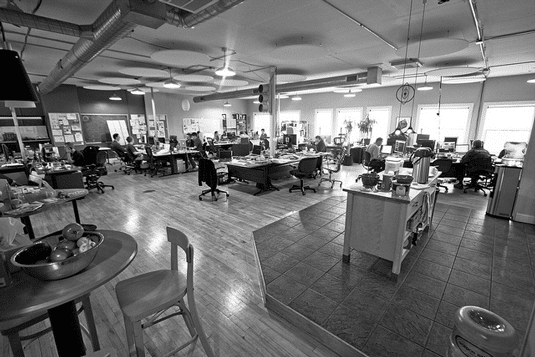 The main floor of our office is approximately 2500 ft2 — not huge, but plenty big enough to be chopped into rooms and halls and private offices. When I show visitors around, I sometimes start with a little joke about how you can take the “tour” while standing in a single spot. This is in fact possible because we essentially work in one big room. Our visitor remarked on the openness of our office. The layout of his similarly-sized company is based on private offices around a central shared area. He was definitely intrigued with what he perceived to be a more modern style of working, but at the same time, clearly nervous about how it would be a big leap for himself and his employees, and one that might have unintended consequences. As our conversation shifted to business practices, it became clear Atomic’s openness also applies to what we share internally. Since we’ve always been open with the financials of the company, I don’t generally think about the alternative and possibly more common strategy of closed or secret books. The same thing goes for our CRM and sales pipeline. We never had to transition to more transparent business practices — we started this way. When I mentioned we don’t have account managers or dedicated project managers sitting between the customer and our project teams, our visitor connected the dots of facilities, business, and customers and remarked on how we really must believe in this idea of openness. I think transparency is the better way to describe the openness this visitor observed. Openness implies there are no boundaries, whereas transparency acknowledges that real boundaries exist. The kind of boundaries I’m talking about are between the work spaces of individuals, employees and the company, and the customer and a project team. In Atomic’s case, these boundaries can be seen through: they’re glass, not brick. I think the consistent application of transparency is a strength, a common thread of intentional culture. You can’t just opt for a cool workspace. In the same way offering snacks or doing standup meetings doesn’t make you an effective agile team, introducing open facilities won’t bring you the benefits of a consistent philosophy of transparency. The system as a whole has an identifiable philosophical basis. One form supports and encourages the other. Shared space encourages shared understanding, ownership, and ideas; transparent business practices make the productively collaborative and oh-so-hip open office environment a viable option for your company. I’ve spent a lot of time in what I refer to as “traditional work cultures” where management tries really hard to ensure that the client only sees the perfected surface, never the greasy, sometimes messy inner-workings of the company. This always seemed inefficient because information was lost or altered at each management level through which it traveled. The excuse was that we wanted to ensure that the client never saw the missteps or mistakes in order to maintain their trust. It’s interesting that places like AO have shown how a company can gain a lot more trust from the client by being transparent (eg: direct communication with the development team) than by “perfecting” communications through management. Nice contrasting report, Rob; thanks. I can’t know for sure, but I’ve always believed that our lack of traditional sales polish is an important part of our consistent transparency. It starts right up front.